To evaluate the impact of viewability and measure its effectiveness, Magna, IPG Media Lab, Moat and The Trade Desk joined together to analyze ad viewability rates as related to overall campaign performance. The research specifically focused on direct-response advertising. While the MRC set the standard, Magna’s research focused on better understanding the relationship between how viewable an ad is to how effective it is. Not surprisingly, the research shows that the more viewable a digital ad is and the more screen time it has, the more likely it is to be effective. The more viewable campaigns are, the more likely they are to lead to a consumer action to buy, click or register, etc. 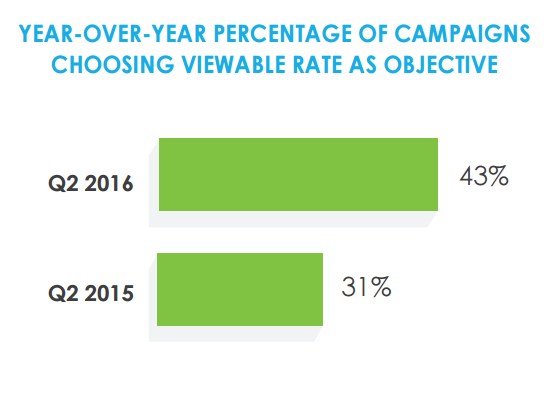 However, viewability is one of many factors connected to a campaign’s success. 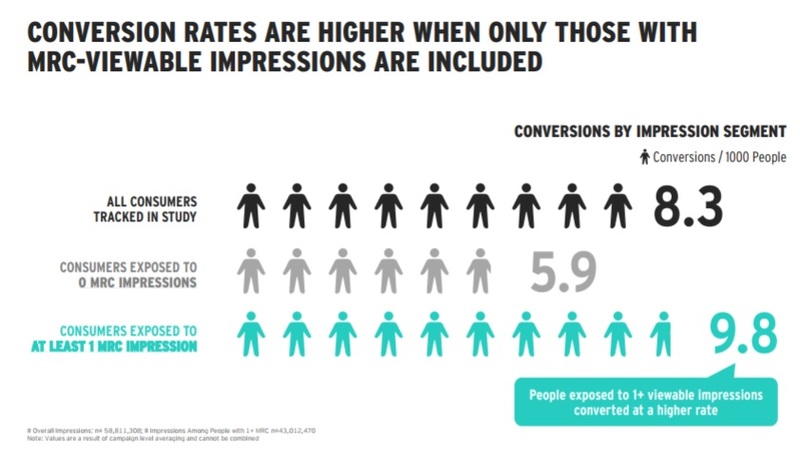 Additional metrics such as ad interaction also show a positive relationship with conversions. Specifically, Magna reports a direct relationship between consumers who interact longer with ads during exposure and their conversion rates. For example, the longer consumers interact with ads during exposure, the more likely they are, at some point, to convert to an action. 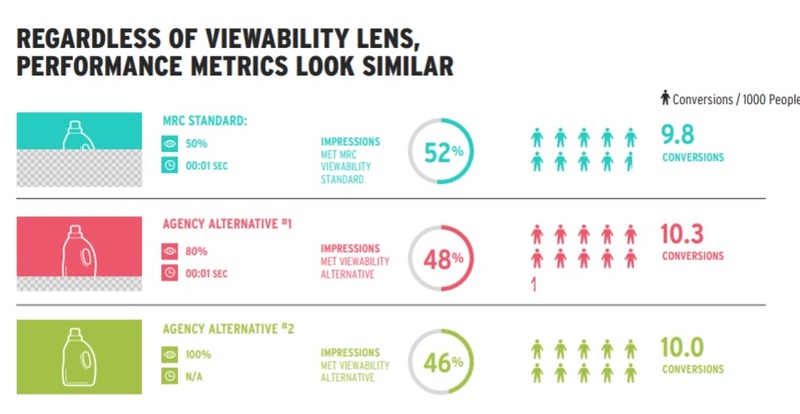 The research provides confirmation that the MRC baseline of viewability is clearly connected to ad effectiveness. It is significant to note that the research also proves that higher levels of viewability required by some agencies (80% to 100%) has no additional impact on ad effectiveness. It’s important for marketers to experiment and test viewability rates and engagement levels to find the best performing combinations. Importantly, measurement of campaign success should include metrics that relate to performance goals. Other metrics such as such as cost, conversion task, target audience, ad format, frequency and others may also to the story of an ad’s performance. What will it take to wake digital advertising’s sleeping giants? Digital media veterans may find solace in this passage from Hemingway’s 1926 novel The Sun Also Rises. “Gradually” could best describe the glacial change to the mobile web we witnessed from 2000 through 2007. But then Steve Jobs introduced the iPhone and “suddenly” we couldn’t move fast enough to keep up with consumers. In every case of digital transformation, there have been “Sleeping Giants” offering premature and often prescient hints that turn into rapid change seemingly overnight. This acceleration is normally brought on by a significant tipping point whether it be a disruptive technology, competitive move, or a provocative press headline. By virtue of the ad dollars he controls, Pritchard is a giant in the industry. While the issues he called out are far from new—particularly to a savvy industry vet like him—the very fact that he so directly addressed them shook the industry. However, despite his call to arms, alarm bells continue to sound. Just this past Monday, Digiday reported that up to 80% of Facebook’s video advertisements weren’t viewable. We first heard this more than a year ago. Facebook tried to fend off the whispers for as long as it could —going so far as to state last year, “we have our own measurement and how we measure.” Yet these whispers have risen to a general outcry. And independent measurement coupled with industry press will carry the message far and wide. Many have called out issues of brand safety over the years, including the more recent renegade Sleeping Giants Twitter account. However, the March headlines out of the UK that reported on extremist content on YouTube changed things overnight. Major advertisers pulled their campaigns. UK and French governments surfaced regulation discussion. Chase Bank began individually whitelisting the sites where its ads could appear. Premium publishers have long highlighted the brand halo that respected content confers on the ads that surround it. But this chorus of major advertisers decrying the effect of negative contexts triggered a precipitous escalation of the issue. But there is a much larger sleeping giant about to rise and roar. DCN and its counterpart organization for the marketers, ANA, have been systematically documenting the issues of building a quality advertising supply chain over the past three years. We started with the shift to viewable impressions. Both organizations have intensely studied invalid traffic and bot fraud across the web. The ANA also recently studied financial transparency and the economics of the ad tech tax. And comScore studied the value of environment and, in turn, brand safety. But documenting the problem does not go nearly far enough. So DCN’s board bravely accepted ANA’s challenge and, in Sept 2016 began to build out a premium digital marketplace called TrustX. 100% premium publisher inventory in an open RTB private marketplace. Check. 100% human and viewable ad supply, or advertisers don’t pay. Check. 100% priority on brand safety and campaign efficacy. Check. 100% trading transparency down to the publisher URL. Check. 100% financial transparency from bid to delivery, reporting and billing. Check. If you do the math, digital advertisers are wasting away more than $10 million per day on overpaying for a murky digital advertising supply chain. I can’t imagine this sort of waste is escaping a CFO or CEO these days. And let’s not forget the ripple effect caused by their dollars and brands being associated with criminal ad fraud or extremist material on predominantly user-generated content experiences like Facebook and YouTube. It is clear that the market demands a solution to these problems—one with scale, simplicity, efficiency, and accountability. On behalf of the premium publishers, we have stepped up and built it: TrustX. I’ve been informed by the TrustX management team that nearly every major agency and brand is leaning into TrustX as exactly what our market needs. So, the only remaining question is who are the Sleeping Giants that will ensure that digital advertising grows up – not gradually but now, suddenly ? Which advertisers and partner agencies will take a stand at scale making the true economic commitments necessary to drive the transparency and accountability priorities that TrustX represents and the industry needs? Programmatic advertising will account for 80% of all digital display advertising in 2017. However, this technology-driven ad buying process has seemingly created as many problems at it’s solved, in the forms of both wasted ad spend and brand risk exposure. 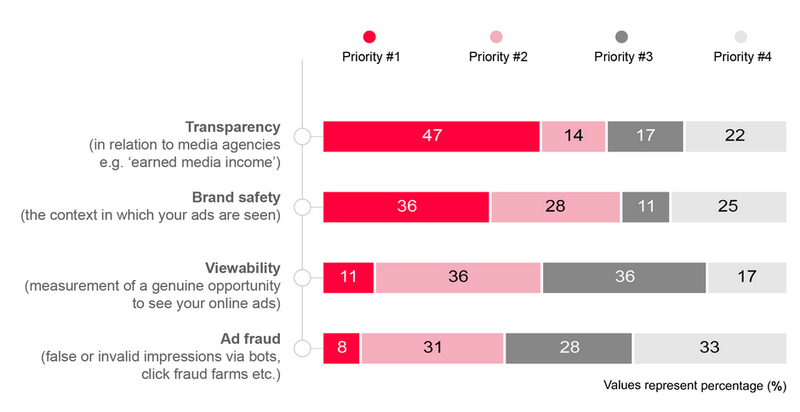 In response, CMOs are taking steps to protect and safeguard their brands by reducing spend in certain digital channels until better controls and compliance measures are in place. With all of the talk over the past couple of years about ad fraud and compromised viewability rates, we as an industry have sort of overlooked the implications of online advertisements that are seen, but in sub-optimal settings. That is to say: How are consumer behaviors impacted when they interact with ads in an unseemly or unexpected context? (Example: a banner ad layered over a hate group recruiting video on YouTube.) Marketers need to understand the impact of these negative advertising experiences. Programmatic versus publisher-direct online ad buying: What do the data say? The industry has been hounded by issues relating to viewability, engagement, and outright fraud for the past couple of years, and the general business press regularly covers the subject matter. So the very same executives who authorized TV, print and radio advertising budgets without raising question one only a few years ago – when the “half of my marketing budget is well-spent, but I’m not sure which half” maxim was fully embraced – now regularly engage in forensic assessments of ad buys. Such is the life of the digital marketer. So it is helpful that companies like Integral Ad Science (though not an entirely objective player in the digital marketing ecosystem) working to keep track of developments via its bi-annual Media Quality Reports. However, depending on one’s point-of-view, the data can be considered a sign of improving conditions, or confirmation that we marketers knowingly *throw away* 10% or more of our budgets to fraud, deception, and advertising malpractice. Conditions Are Improving. Though there continues to be a good deal of waste in the system, the overall state of online advertising is showing signs of improvement. For example, the U.S. market saw a significant drop in “objectionable content” impressions during the first half of 2016 versus the previous period (9.5% versus 14.0%). Most industry experts agree this is due to more sophisticated tools and digital ad buying practices, as one would expect in a growing and evolving industry sector. Buying Direct Has Its Benefits. 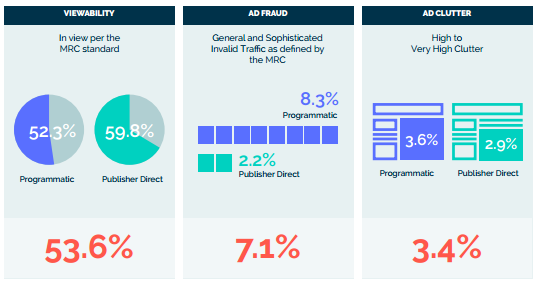 The incidence of ad fraud when buying advertising direct from publishers is dramatically lower than when buying programmatically (2.2% versus 8.3% in the U.S.), though it’s also typically more expensive, making the equation palatable for most marketers. Viewability & Clutter Are Continuing Concerns. Fewer than half of all display ads – regardless of how purchased – get viewed for more than five seconds, and more than 10% of ad impressions are jammed onto pages with more than four ads on the page. These issues are compounded via mobile devices, which we cited in a recent article on the pros and cons of programmatic as “just a messy consumer experience”. Bigger & Vertical Are Better. Large format, vertically-oriented display ad formats (300×600, 300×1050, 160×600) all tend to have better viewability than their smaller, rectangular and square counterparts – being viewed for more than five seconds about half the time. Global Video Ads Are Best Purchased Direct. Viewability of video via programmatic means are only viewable at a 3-in-10 ratio, versus nearly 7-in-10 via publisher direct. This metric constitutes the biggest relative weakness of programmatic in the study. While IAS’s analysis of the first half of 2016 has many encouraging findings, it’s also clear that the programmatic marketing industry has plenty of opportunities for improvements in the coming months and years. 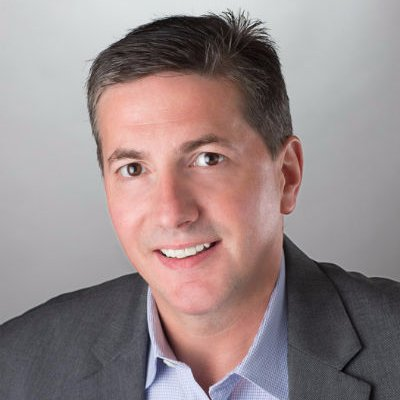 Dave Marquard is currently Vice President of Product Management, Publisher Solutions and RTB Products at Integral Ad Science. 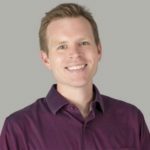 For the past 15 years he has held leadership roles in product management, engineering, and marketing at internet technology and enterprise software firms such as Google, IBM, and Lombardi Software. To mock or not to mock? That is the question frequently asked by media publishers trying to meet advertiser demands related to digital campaign success. The industry’s intense focus on viewability and transparency issues associated with ad fraud hijacks the limelight from another vital area of interest for advertisers: Are campaigns actually running as contracted? To justify the millions (and millions!) of dollars spent promoting products, advertisers rightfully demand proof that their campaigns execute as promised. From expected ad rendering on the page to accurate targeting by geography and behavior profiles, advertisers want to know that the right ad has been served in the right way in the right location on the right page to the right demographic. In fact, when considering the average spend of a large-scale national campaign flight, many advertisers will assert they deserve to know their campaign is performing as promised. A Photoshopped mock-up or full-page capture of the ad on a screen is a start, but it isn’t enough. Presenting a “mock-up” of how an ad should look could be considered fraudulent as it’s not a true representation of how an ad performs across all formats, devices and geographies. In fact, several industries (Tier 2 automotive, pharmaceutical, etc.) and countries (especially those in Latin America) regulate advertising-based billing processes and require third-party verified screenshots upon invoice presentation. Legitimacy: Screenshots of ads in a live environment truthfully demonstrate that an ad is delivered to the right target. A “mock-up” or “test page” may display how an ad appears on a site, but in reality it provides a false sense of security for how the ad is actually executing. It also infers that the ad will render the same across all devices, OS, formats and geographies. Accuracy: Mock-ups can’t prove ad placement as many ad units only occur behind paywalls or require an IP address in order to serve the correct messaging to the individual user. Automation: Imagine scaling the manual process of verifying ads across the overwhelming number of devices, browsers, user profiles, formats, sizes and geo-locations. Without automation, the task is almost impossible. Leverage technology to streamline the process. Costs: Carefully consider the total cost of ownership when deciding between an in-house or outsourced process. While in-house resources are easier to control, it is difficult to secure funding and keep the staff engaged. On the flip side, outsourcing requires integration, training, probable coordination with targeting vendors, and continuous oversight which could ultimately be more costly than anticipated—not to mention the complications of managing a remote team, in a case of choosing a non-local entity if a non-native entity is selected. Quality Assurance: Reliance on mock-up designs to certify campaign execution will no catch errors that occur at launch or throughout the campaign flight.